To unpack the stupidity, in order - L. Ron Hubbard would later found Scientology, but there was no such thing when he was working with Parsons. The two of them were trying to perform a version of the Moonchild Ritual found in Aleister Crowley's (fictional) novel of the same name in 1946. Parsons wrote to Crowley about it, who though the whole thing was dumb. What they were doing wasn't a real magical ritual, after all, but something that Crowley just made up for a book. My take on the whole thing is that the Moonchild Ritual was performed once and it gave birth to the Church of Scientology, which is a very strong argument for it never being performed again. Parsons believed the ritual succeeded when artist Marjorie Cameron showed up on his doorstep out of the blue. She would later portray the goddess Babalon (note: not "Babylon") in Kenneth Anger's 1954 film Inauguration of the Pleasure Dome. The stolen emails from Wikileaks don't prove anything about occultism. The couple of emails about "spirit cooking" referred to a performance art piece, which is one more argument supporting my contention that performance artists should not appropriate terms related to real magical work - but that's a whole other conversation. The one about the "fatted calf" and so forth was tongue-in-cheek sarcasm that is so blatantly obvious. And, of course, the alleged occult components of "Pizzagate" were all made up like the rest of it. John Podesta is apparently a paranormal enthusiast who's interested in stuff like UFO's, but that's a far cry from him being a wizard or something. There is of course no mention in those emails of anyone believing Hillary Clinton to be the "Whore of Babylon" or in any way related to "the Antichrist." Horn just seems to have mentioned it because the couple of bits above are "occult" and ushering in the Antichrist is just what occultists do. Like most fundie Christians, he actually has no concept of what real occultism is and how it works, just a bunch of sensational garbage he probably first encountered in a Jack Chick tract - who, by the way, also doesn't know anything about real occultists or what we do. Just because we don't follow the oversimplified cosmology of Christianity doesn't mean we care that people are Christian. We only care when they try to impose their religious rules on us. If they were willing to mind their own business, we would get along fine. 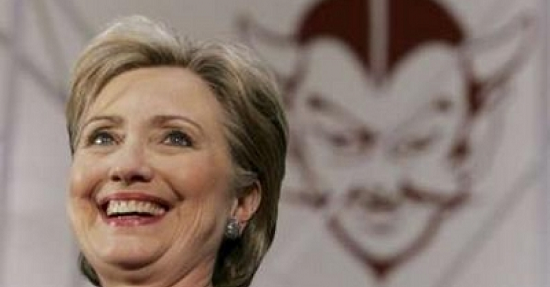 And does anybody else really see Hillary Clinton as "the archetype divine feminine?" For that matter, as I read Revelation that's not even what the Whore of Babylon is supposed to represent. I suppose somebody who explicitly hated women and feminists might think so, but that really has nothing to do with what St. John was talking about. One of my big pet peeves, as a matter of fact, is when I come across sanctimonious Christians who don't know the Bible better than Thelemite me. They really need to understand their holy texts before they start throwing quotes around, let along trying to interpret the underlying message. As for Hillary Clinton in 2020, I hope not. The Democrats need new blood (and no, Christian nutters, I don't mean literal blood) that will better appeal to younger voters and get them out to the polls. I supported Bernie Sanders in the 2016 primary, but he's older than Clinton and next time around I expect I'll be supporting a younger candidate than either of them. 72 has some significance in gematria (such as the 72 names of the Shem Ha-Mephorash) but there are a lot of other numbers with similar importance. Soror Hilarion was a real person, poet Jeanne Foster, born in 1879 - long before Clinton's birth in 1947. The similarity of her magical motto to Clinton's first name is entirely coincidental. She worked with Crowley but I'm not sure she ever met Parsons, though they were both alive in the 1940's. I'm thinking that Horn may have confused "Hilarion" with "Belarion," an entity Parsons claimed to embody in some of his anti-Christian writings and which is at least in the ballpark of Horn's description. Fundies are perfectly happy to get their facts wrong as long as those wrong facts smear the Clintons. It's utterly bizarre. I suppose it shows that once you unleash a massive smear campaign, whether the allegations are true or not you can never put it down - even by admitting that you personally wrote it and it's all made up.